After taking “Desserts” off, Mel is back in the tent with Sue for pie week. Unfortunately, the looser, more playful Sue of the previous episode is nowhere to be found and many of the strongest elements in “Desserts” now feel like blips, rather than breakthroughs. Fans of Baking Show know both Mel and Sue eventually embrace their sillier sides, giving the show a more casual and immediate feel, but alas, despite the near constant pun and innuendo softballs the challenges and bakers lob their way, both hosts appear to be on their best behavior, stepping away from the action when the more seasoned Mel and Sue of future seasons would dive in head first. While Americans think of pie almost exclusively as a sweet confection, the signature challenge tasks the bakers with putting their spin on a British classic, the Wellington. This is a beef or other savory filling wrapped in puff pastry and baked. The Wellingtons need to be at least eight inches long, but otherwise the bakers can use their imaginations, and they do, with some going more traditional and others using fish, venison, or even vegetarian fillings. The bakers seem pretty confident with this challenge and while there’s some discussion of which type of pastry to use, puff or the quicker rough puff, overall they’re off to a good start. Brendan takes a risk with a cheese-based pastry and gets positive feedback, but on the whole, the bakers play this round safe. Brendan’s salmon coulibiac and Cathryn’s sausage roll-inspired bake get full marks but, with the glaring exception of Sarah-Jane, just about everyone else winds up presenting a Wellington with a delicious filling and a somewhat flawed pastry. Sarah-Jane doesn’t pick up on the boulder-sized hints Mary and Paul throw her way to refrigerate her beef before wrapping it in pastry and baking it. The beef ends up melting the butter in her pastry before the pastry can cook, causing it to ooze down the side of the filling, leading to what Paul considers a rather Alien-inspired bake. Sarah-Jane takes it like a champ, though, and does her best to reset and clear her head for the technical. Before the technical challenge, though, there’s a surprise: the first historical segment of the season! Mel interviews food journalist Oliver Thring and pie shop owner Clive Mellor about the British history of eel pies, which were once a staple of working-class London cuisine. Basically, when the Thames was super polluted, just about the only thing that could still live in it was eels, so they became a popular (read: cheap and filling) choice for the lower classes. Mel finishes the segment by gamely trying an admittedly delicious-looking eel pie and remarks that eel is surprisingly delicate and not at all what she expected. While this is an interesting aside and it’s nice to see the historical segments return (they’re usually the first to go when episodes start to run long), there’s too much of a remove between the topic of Mel’s segment, eel pies in working class historical London, and the bakers’ challenges. Having a more direct connection than just “pie” would have made the segment feel more essential and less like filler. Returning to the tent, it’s time for the technical challenge, and like “Desserts”’ crème caramel, this one is a bruiser. The bakers must make two hand-raised pies with distinct layers of chicken, bacon, and apricot inside. This is a technique new to all of the bakers and one that requires using a dolly, or a tall, rounded wood block with a handle, to form the pastry base and sides. The bakers must carefully remove the pastry from the dolly before filling and baking it, and this is where many seem to struggle. However, because none of the bakers quite figure out how to manage the pastry removal, or at least the camera doesn’t capture them doing so, this is a very unsatisfying technical. Viewers want to leave the technical understanding what bakers did wrong or how they’d attempt this at home. Even those who rank highest, Cathryn, John, and Brendan, don’t quite manage a flaky pastry with a solid seal that locks in the jelly. It would be out of the ordinary for the show, but a quick demonstration from Paul of the appropriate dolly technique would have gone a long way toward helping viewers follow along during the process, and would have made the bakers’ results feel less arbitrary. After the bakers spend a long evening waiting for their results, Paul and Mary kick off the second day by judging the technical and aside from post-signature challenge frontrunners Cathryn and Brendan, who placed first and third in the technical, it’s an open field. No one did great on the technical, which means the showstopper will be make-or-break. The showstopper challenge is simple: Make a family-sized American pie. Here at last is how Americans think of pie: communal and sweet, and designed as a special treat rather than a daily occurrence. There’s a lot of creativity on display, with some bakers taking on traditional American favorites and others adapting their pies for the British palate. After almost nailing the signature, but bombing the technical, Ryan is getting a lot of screen time. In a different episode, this would be the loser’s edit, preparing the audience to accept Ryan’s eventual elimination as inevitable and appropriate. 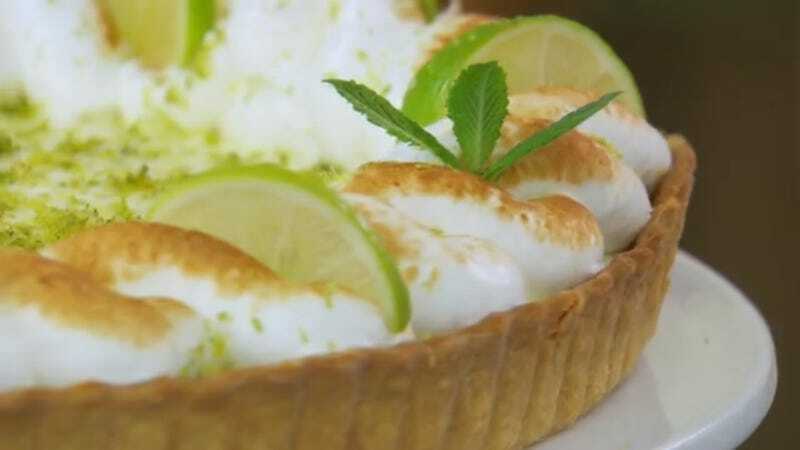 Instead, he comes roaring back with a sublime take on Key Lime Pie, adding ginger to the pastry and the filling to complement the tangy citrus of the lime, rather than highlight the potential cloying sweetness of the condensed milk. Ryan must know his pie tastes good—all of the bakers have been practicing their bakes between tapings—but he doesn’t seem to understand just how good his recipe is. Right up until the judging, he’s worried he’ll be eliminated and despite the rapturous comments from the usually reserved Paul and Mary, he still seems on edge when interviewed before the final results are announced. Ryan never fully hears and processes his achievement on camera, he’s anxious and stunned even in victory, so while the buildup is exciting, the episode doesn’t stick the landing for its triumphant underdog narrative. One can only hope he let himself feel the full weight of his accomplishment once he got home. Most of the bakes put together for the showstopper look delicious, even Cathryn’s apparently rather unfortunate chocolate and peanut butter pumpkin pie. Brendan’s all-American chiffon pie looks particularly gorgeous. The judges make a big point of his use of pectin to set his filling, but there are plenty of Americans who would happily scoop up Manisha’s banana scotch pie and go back for another piece. This is a competition and her pie did look a complete mess, and she did deserve to be eliminated, but it’s not all that uncommon for banana cream pies to spill out past their crust and frankly, a cream and meringue pie that stays too rigid is a worse crime than one that seeps. Manisha is clearly a talented baker who can decorate the socks off of many of the bakers still in the tent, but at the end of the day, it’s her turn to head home (and those chocolate-hating brothers of hers better not give her any grief!). We’re already halfway through the season, but surprisingly, few standouts have begun separating from the crowd. If Ryan maintains his upward trajectory, it really could be anyone’s season. I have made Ryan’s Key Lime Pie several times since I heard about it after this episode originally aired in 2012. It is absolutely as delicious as depicted here. Don’t take my word for it, though, go make it yourself. I’ve yet to fully capture its insane yumminess, as I can never find stem ginger in American grocery stores and as I mentioned in my previous recap, meringue hates me. Even with these tweaks, it’s delicate, flavorful, tangy, and insanely good. Plus you get to bust out the mini-blowtorch, which is always fun. Try adapting the recipe for mini-tarts or making it in a muffin tin for a bulk or one-bite option. Sarah-Jane, talking about her Wellington, is me every Christmas when I’m put in charge of the family Choice or Prime standing rib roast: “It’s scary, isn’t it? It’s, like, the best cut of beef. It’s expensive. If I mess it up and make it disgusting, that’d be awful!” It’s definitely stressful, in an admittedly very first-world-problems way. Another reminder that this is an earlier season than Baking Show fans are used to seeing- future contestants won’t be phased at all by hot water crust recipes, hand-raised pies, or dollies. Ouch, Danny- if even Mary says there’s too much booze, you know you need to rethink the recipe. In further defense of Manisha, a story: It’s Kulzick family lore that when my paternal grandfather met my grandmother’s family for the first time over dinner, dessert was homemade lemon meringue pie. My grandfather went to sweep his fork into the pie and grab a taste to no avail- it was rock hard. He assumed they were pranking him until he saw his future father-in-law pick up a slice with his hand and dunk it straight down into his coffee, which got the meringue and lemon curd to soften enough that he could eat it. My grandpa avoided the pie after that. The moral of the story: there are worse things than wobbly, somewhat runny cream pie.